If you worked at WPSC-FM, and this photo doesn't bring a nostalgic tear to your eye, then you have no soul. This was what you stared at for hours on end. 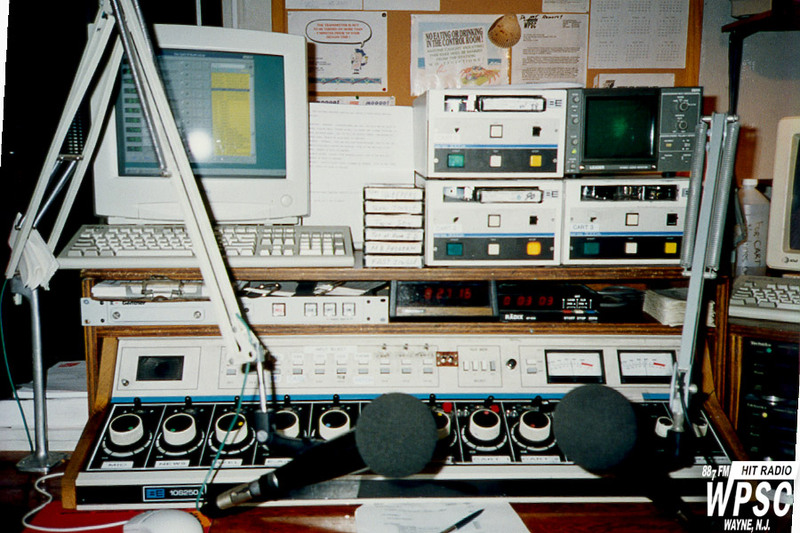 By the end of WPSC-FM's run in 1998, some slight upgrades had been made. There was the Dell workstation with BSI Wavecart, the three old and trusty BE wide mouth cart machines. A new Leader Stereo Phase monitor had replaced the old scope. Below was the Gentner digital phone hybrid, Irish John's Heathkit clock, and that little hacked together RADIX timer. But the real star of this photo was that old BE 10S250A console. That little board was old and tired and modified, but was with us the whole way, rarely (if ever) letting us down. If you were good, that board was fast and you could run a tight show. If you were bad, that board would not help you, but rather, would laugh as you spiraled out of control. The board is the heart and soul of any radio station, and it is impossible to think about being on air at WPSC-FM without remembering the heavy feel of the stepper pots, the click of the mic switch, and cranking that monitor pot up for one of your favorite songs.